ARM has announced that a new highly-efficient graphics processing unit (GPU) is available for immediate licensing. Due to the proliferation of smartphones people have grown to expect sophisticated and immersive graphics on all digital devices. 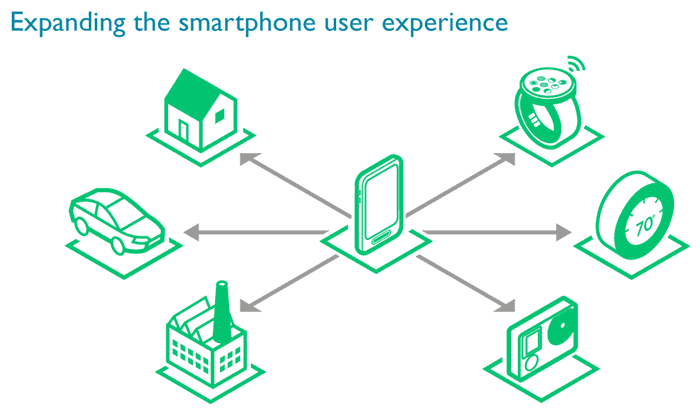 ARM aims to provide such graphics for the low-power-budget likes of smartwatches, wearables, industrial control panels, healthcare monitors and IoT devices, via the new Mali-470 GPU. 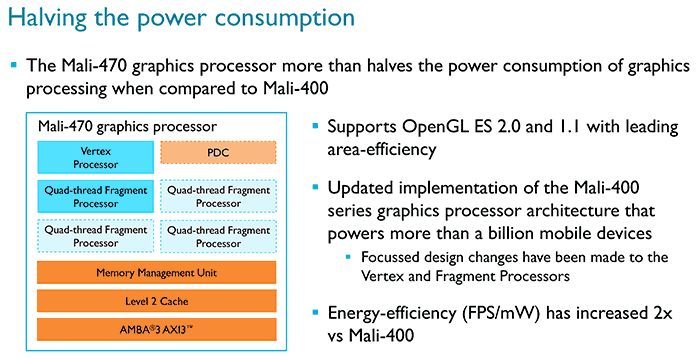 In a press release announcing the new GPU, ARM says that the Mali-470 builds on the success of the Mali-400 (which can be found in over a billion devices worldwide) while "halving the power consumption at the same process geometry". Explaining the method of processor design at ARM, Mark Dickinson, VP & GM multimedia processing group, said "ARM scrutinizes every milliwatt across the entire SoC to enable OEMs to optimize energy-efficiency and open up new opportunities". ARM forsees designers building stronger display capabilities and touch interfaces into highly power-constrained devices, which previously relied upon buttons or small displays. There are many applications where greater power efficiency is desirable and the lower profile of the Mali-470 GPU can bring improved graphics experiences and information flow. In the introduction we mentioned smartwatches and wearables, which are growing markets and where people really appreciate better battery life. The IoT market is still on the edge of its expected explosion. If such devices can sport better, smartphone-quality graphical interfaces it will only help their speed of adoption. Chipmaker MediaTek has already signalled that it will be making SoCs with integrated ARM Mali-470 GPUs. It is expected that the Mali-470 will be combined with the low-power ARM Cortex-A7 or Cortex-A53 processors in optimised SoCs. However such chip design and testing, and subsequent device design and testing, takes time: so this highly-efficient GPU is not expected to be in shipping devices until about this time next year.